In today’s world, we are looking at screens all the time. For this reason, if we want to keep our eyes healthy, we should be choosy about screens we look. When choosing a monitor to use with a desktop or laptop PC or a gaming console, you should definitely consider its effects on your eyes. You will be staring at this monitor for many hours to work or game. If you have kids, this becomes more important because children are more vulnerable to eye problems like eye strain and eye fatigue. It may seem hard to choose the best monitor for eyes because there are so many technologies, factors, brands and monitors to consider. So we have prepared this guide to help you on this topic. In this guide, you may read a detailed guide about how to choose the best monitor for eyes. You should go through this guide to learn more about eye health, Computer Vision Syndrome, monitor types and newest display technologies to reduce eye strain. We have made a deep research in eye health guides, forums, Reddit, shopping sites, tech communities and more to find the most eye-friendly monitors. Tons of programmers, designers, webmasters, and editors share their advice about choosing a monitor for preventing eye strain and we have built this guide regarding this advice. We have talked about all details you need to know about. In the end, you may find our recommended monitors list. Computer screens have some effects on your eyes and there are several reasons for eye strain and Computer Vision Syndrome. If you want to choose the best eye-friendly monitor, you should consider a few factors. These are causes of eye strain; blue light, display flicker, refresh rate, screen resolution, screen glare, brightness, display panel, ergonomics, good posture and working environment. Now, we will talk about each one and go into the details of each topic. 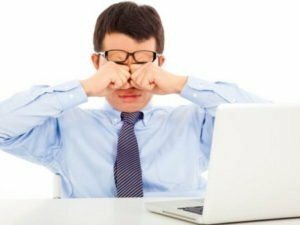 Eye strain is a symptom occurs when your eyes get tired of intense use such as working at the computer or reading a book for an extended period of time. If you feel discomfort after looking something for a long time, it means you have eye strain. You may feel eye fatigue, pain around the eyes, headache, blurred vision or other symptoms. Eye strain is not an eye disease and it goes away once you rest your eyes. But it definitely affects your daily life and you should prevent your eyes from it. Eye strain and eye fatigue are one of the most common problems in these days. Eye strain is a part of Computer Vision Syndrome which are eye problems caused by computer use. In these days, there are many people have jobs that require using computers for at least 5-6 hours. Research shows that more than 50% of these people suffer from eye strain. Not just working adults, kids and elderly people also complain about eye strain because tablets, smartphones, and most of the electronic devices have screens. So, what are the causes of eye strain? What should you consider when buying a new monitor for your eyes? Let’s get to the work! First, what is blue light and why it is bad for your eyes? As humans, we can see red, orange, yellow, green, blue, indigo and violet light. So blue light is one of the visible lights. It has some benefits like boosting alertness, helping memory and elevating mood. It also helps to regulate our sleep/wake cycle. But blue light can also be harmful to your eyes and cause eye strain, eye fatigue, headaches and more. But how does blue light affect our eyes? Let’s find out. Blue light’s wavelength puts it close to UVA and that is the reason for the strain on your eyes. Below, you may find a great image that shows the relationship between blue light and our eyes. So, blue light from monitors, screens, and TVs may cause eye strain, headaches, eye damage, sleep disorders and may result in myopia and macular degeneration in long term. When we stare at a screen for hours of time, we have exposed the blue light. If you want to find the best monitor for eyes, you should definitely consider buying a monitor with a blue light filter. How does blue light affect your eyes? Image source: ASUS website. There are several technologies to filter blue light on screens. They have different names but in fact, they all try to do one thing: Filtering blue light. ASUS, BenQ, EZIO and some other monitor brands provide a menu that allows you to choose between different blue light levels for different purposes. Some other monitors come with external filters and there are other solutions like blue light filtering glasses or software named flux. Advice: If you want to prevent eye strain, you should definitely choose a monitor with a blue light filter. In these days, most of the screens come with LED backlight. When you use a monitor, LED backlight tries to maintain the brightness of the display. Flicker is caused by this because the backlight rapidly turns on and off to maintain the brightness at the same level. This technology has been used in LED monitors for a long time because it works well. But it can also cause flickering which hurts your eyes especially at low levels of brightness. Flicker cause constant changes in brightness and these changes in light intensity turns into eye strain, headaches, and eye fatigue. It controls brightness but also hurts our eyes. So what should we do? Brightness controlling is also named as “dimming” and there are two types of dimming. First one is PWM Dimming and the second one is DC Dimming. LED monitors generally use PVM because its design is simple and this dimming technology is easy for mass producing. 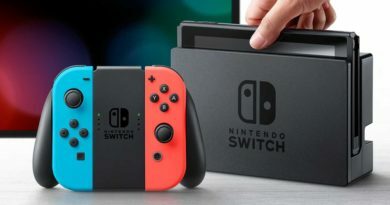 It controls the brightness by regulating flicker intervals. Even a screen is flashing at a high speed (like 200 Hz), some people still perceive flicker with PWM dimming. This image shows effects of DC dimming on eye strain, according to a research from Kitasato University (Japan). Image source: EIZO website. But the other dimming technology, DC dimming, controls brightness through the electric current. This provides a flicker-free screen experience. DC dimming is an expensive technology but if you want to protect your eyes, you should definitely go after this one. EIZO and BenQ use DC dimming, ASUS uses Flicker-Free with Smart Dynamic Backlight Adjustment and other brands use different named technologies to prevent flickering. Your new monitor should also have a high refresh rate which is better for your eyes. 120 Hz or 144 Hz monitors are pretty popular these days and if you ever tried 12o Hz or 144 Hz monitors, you will see that these monitors provide a smoother viewing experience. I should also say that a 120 Hz or 144 Hz monitor will definitely improve your gaming working experience. In these days, I would recommend buying a monitor with high refresh rate because they are not so expensive and things look a lot smoother on them. You may watch this video from Linus to get a better understanding of refresh rates on TVs and monitors. Advice: You should choose a monitor with high refresh rate and a technology which minimizes or eliminates display flickering. For screen sizes between 22″ – 24″, pick a 1080p monitor. For screen sizes between 24″ – 27″, pick a 1440p or 4K monitor. For screen sizes between 27″ – 30″, pick a 4K monitor. In terms of screen resolution, a higher resolution (for same display size) is usually better for your eyes because increased sharpness is better for your eye health. Dr. Gary Heiting from AllAboutVision says: “Increasing screen resolution so it exceeds the discriminating ability of the eye lowers the risk of strain, by making objects and print more defined and comfortable to focus on.” So, I can easily say that you should use a 1080p, a 1440p or a 4K monitor with setting up the icons and text for the best view. Don’t let the icons and text stay small on the screen because it would be hard to see them on a bigger screen. Advice: Choose a monitor with high resolution and high PPI (Pixel Per Inch). Glossy screens are bad for your eyes. A glossy screen affects your eyes badly. Smooth and glossy surfaces reflect light back and you may see some unwanted reflections of yourself or glare. These reflections are annoying, distracting and also bad for your eye health. Glossy screens cause eye strain, eye fatigue, and headaches. If you want to protect your eyes from eye strain, you should buy a monitor with an anti-glare panel. 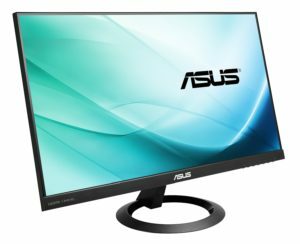 Some of the ASUS monitors come with ASUS A+ Anti-Glare panel, BenQ has anti-glare monitors and most of the decent monitors have other technologies to prevent glossy screens. An anti-glare panel reduces reflections and glare in bright environments. I definitely recommend choosing a monitor with an anti-glare panel. That would be a must for choosing the best monitor for your eyes. Advice: Choose a monitor with an anti-glare panel. Screen brightness is another important factor you need to consider when choosing the best monitor for eyes. Monitors that are too bright or too dark can cause eye strain and eye fatigue. You should buy a new monitor with automatic brightness adjustment. For example, EZIO uses a new technology named Auto EcoView. This technology automatically adjusts the screen’s brightness to the correct level calculating ambient lighting. Brightness is related to screen flickering and like we said before, it is very important for eye comfort. Too bright or too dark screens can lead to eye strain, headaches, eye fatigue and other discomforts. Advice: Choose a monitor with adjustable or auto brightness. There are three main display panel types for screens: IPS, VA and TN panels. Screens with TN panels are best for gaming but these are not the best for your eyes. If you want a monitor that goes easy to your eyes, you should pick a monitor with an IPS panel. There are several IPS panel types like S-IPS, H-IPS, Super PLS, and AHVA. These are all expensive but eye-friendly display panels and your first choice should buy a monitor with one of these. You may also buy S-PVA/MVA/VA panels because they also provide decent colors, contrast ratio, and brightness nearly as an IPS panel monitor. 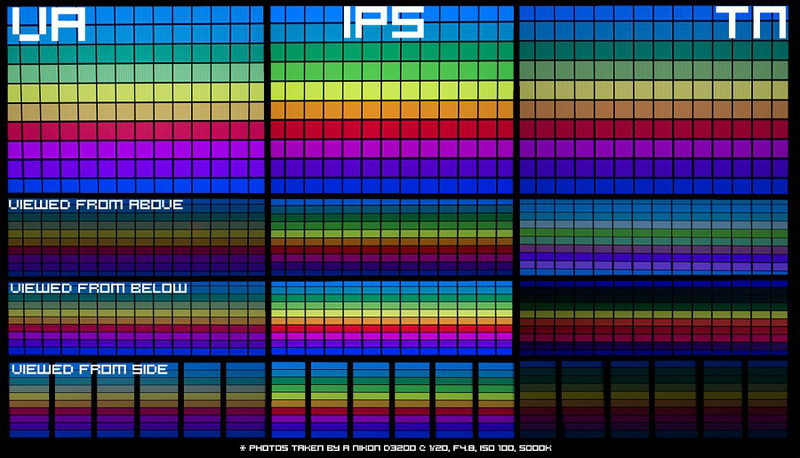 This image shows a comparison between TN panels, VA panels and IPS panels. Advice: Choose a monitor with an IPS panel or VA panel. When people buy a monitor for their eyes, they usually don’t spend much time on its ergonomics or their working posture. I want to say that, ergonomics and good working posture is as important as other factors to prevent eye strain, headaches, sore necks and other discomforts. If you work with a bad posture and non-ergonomic monitors, you can’t have healthy eyes and a healthy brain. First, you should choose a monitor with an ergonomic design. That means your new monitor should be highly adjustable. You should adjust its height, viewing angles, rotation, and orientation. Most of the new, decent monitors can be adjusted horizontally and vertically. If you want your monitor to be totally adjustable, you can always buy a monitor arm and create your own, comfortable monitor setup. Advice: Choose a monitor with high adjustment capabilities. When its come to sitting posture, there are a few things you need to consider. You should sit up straight, sit back in the chair and rest your back fully against the backrest of your chair. Your line of sight should be straight ahead or slightly downward because looking straight ahead at the monitor is good for your neck but it can strain your eyes. You should be at least 40-50 centimeters from the screen. Make minor or major adjustments to the angle, height, rotation or orientation of your screen to prevent light reflection. Here is a great image of the correct posture and monitor position to prevent eye strain and headaches. Image source: EIZO website. Regarding the factors told above, we have listed the best monitors for eyes. You may pick one of these monitors for your working, gaming or multimedia setup. All these monitors have eye-protecting technologies, low blue light modes, quality display panels, adjustable parts and good color quality. Here are the 5 best monitors for preventing eye strain and eye fatigue. 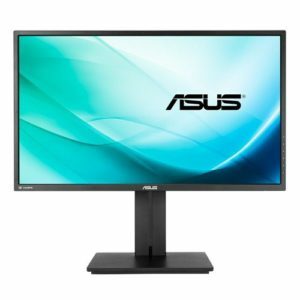 ASUS PB279Q is a 27″ monitor with 3840 x 2160 display. It has an IPS display panel which is the best one for your eyes. It comes with ASUS Eye Care Technology which provides Blue Light Filter and Flicker Free experience to prevent eye fatigue and eye strain. By using Smart Dynamic Backlight Adjustment, it gives you a smooth and eye-friendly using experience. You may select between different filter settings onscreen for the best eye protection. It is ergonomically designed to let you choose between different height adjustments. ASUS PB279Q has a DisplayPort 1.2, a Mini-DisplayPort and four HDMI 1.4 / MHL ports on it. Picture-in-Picture and Picture-by-Picture features are available and you can view four 4K sources on it. It has a really ergonomic design and you can use it in portrait mode too. 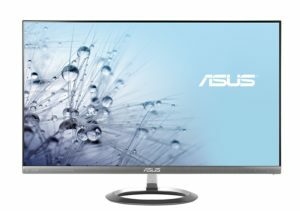 ASUS PB279Q is one of the best monitors for eyes and with its powerful features, you should definitely check out this monitor and read user reviews. ASUS MX27AQ is another great choice for eye-friendly monitors. It comes with a 27″ 2560 x 1440 IPS display panel and provides a gets you a frameless screen. This one also has ASUS Eye Care Technology and this includes features like Flicker Free display and Blue Light Filter for less eye fatigue and eye strain. With an OSD menu, you can choose between different brightness and blue light levels. AH-IPS panel with wide 178° viewing angles minimizes color shifting. ASUS MX27AQ has various ports on it; 2 HDMI ports, HML ports, and a Display Port. This monitor also provides a great sound performance with Band & Olufsen ICEpower so you will definitely be happy with the sound quality. I really liked its frameless design and this one is a really thin monitor with lots of ergonomic adjustments. If you want to have an eye-friendly monitor for work or entertainment, this one could be a really great choice. 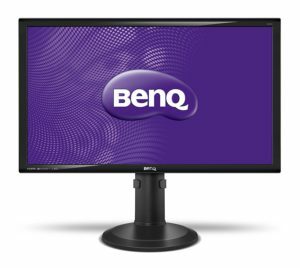 BenQ GW2765HT is a well-designed option for the best monitor for your eyes. It has a 27″ 2560 x 1440 IPS panel. For extended viewing comfort, it has Zero Flicker and Low Blue Light features which is crucial for preventing eye strain. BenQ names this technology as “Revolution Eyes” and I can say that it works for me and my office fellas. Its WQHD panel provides 109 pixel per inch that allows images and movies look gorgeous on it. BenQ GW2765HT has lots of ports on it; VGA, DVI-D, Display Port and HDMI. Its built-in speakers provide enough audio quality for general purpose. Like other high-class monitors, it has a nice menu to choose between modes like Standard, Movie, Game, Photo, sRGB, Reading and Eco. I should say that Eco Mode will really help you to save some money by lowering electric bills. 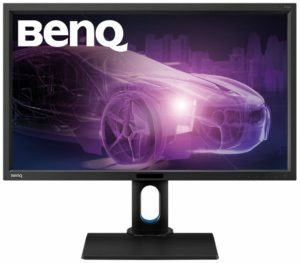 When choosing your new monitor, consider BenQ GW2765HT and read its reviews from different users. BL2711U is a 27″ IPS monitor with 4K2K HD resolution with 20,000,000:1 Dynamic Contrast Ratio for exceptional color accuracy. To prevent eye strain and eye fatigue, it comes with Zero Flicker and Low Blue Light technology. It renders colors professionally with 100% sRGB and Rec. 709 color space. For ergonomics, you can easily adjust its height and rotation for the best viewing experience. If you are a designer, this could be the best monitor choice for you because it has CAD/CAM mode that offers superior contrast on 3D color lines. It also has the Animation Mode that enhances the creative process and provides a great experience for designers. PIP and PBP are also available on BL2711U. There are Display Port, DVI-D, and HDMI ports on this monitor and you should definitely read user reviews for it. ASUS VX24AH is a 23.8″ monitor with 2560 x 1440 resolution and IPS display technology. This one also comes with ASUS Eye Care Technology; Flicker-Free and Blue Light Filter to eliminate eye strain and eye fatigue. Colors look great on it and it has an anti-glare panel which is great for choosing the best monitor for eyes. It provides really nice viewing angles up to 178° and comes with a frameless bezel for multi-monitor configurations. ASUS VX24AH has a VGA port and two HDMI ports with MHL support on it. This one would be a great choice for anyone wants a decent monitor for both console or pc gaming and office work. You can also pick two or three of this monitor and create a multi-monitor beast setup. If you need an eye and budget-friendly IPS monitor with quality, you should definitely check out ASUS VX24AH.